The Double R Diner found an uncannily perfect setting in Twede’s Cafe — before it was Twede’s Cafe, and before Twede’s Cafe took a hiatus from being the Double R Diner. Built in 1940, the restaurant that would become Twede’s Cafe opened to the public as Thompson’s Diner in 1941. It was taken over a decade or so later by new owners, who changed the name to the Mar-T Cafe, installed the now-iconic exterior neon sign (hence the large “Mar-T” hovering unacknowledged above the Double R’s sign), but otherwise left both the building and the decor largely unchanged. 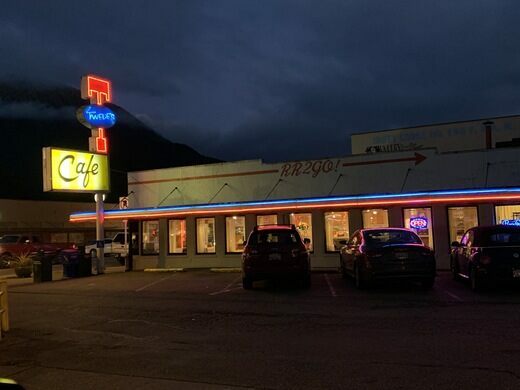 Thus, when shooting on the original Twin Peaks series began in 1989, the Mar-T Cafe was well-equipped to serve as the noir Americana backdrop to romantic and investigatory intrigue in Lynch’s haunted mountain town. Its tobacco brown wood panelling, horseshoe lunch counter, and chrome-and-vinyl stools appeared in the series pilot as well as the later prequel film Fire Walk With Me, and served as the model for the Hollywood sound stage set where all other Double R Diner interior scenes were actually shot. 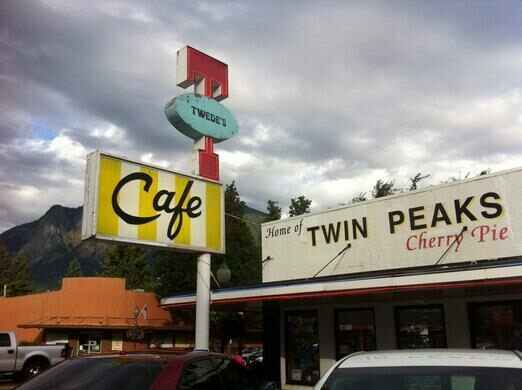 Once Twin Peaks hit the air, the Mar-T Cafe saw a major influx of business. Fans of the show flocked to the diner; pastry crews churned out pies to keep up with demand; waitresses fielded nonstop requests for “damn fine coffee” with patience and grace. By the late 1990s, however, the mania had waned, and the restaurant was sold in 1998 to Kyle Twede (pronounced “tweetie”), who renamed it — you guessed it — Twede’s Cafe. The newly rebranded FDR-era diner would be short-lived, however, as a fire gutted the Packard Mill — sorry, I mean Twede’s Cafe, in July 2000. The fire was the result of arson. News reports from the time described the perpetrators as burglars who had set the blaze to cover their theft of $450. However, in a May 2015 interview, Kyle Twede described the arsonists as kids who had broken into the restaurant to mess around and drink wine coolers and then, fearing they would get in trouble for their actions, decided to set the place on fire (an apparent reference to a separate incident in 1997). Whatever the case may be, the interior was completely destroyed. While the structure and the exterior neon sign remained, Twede’s Cafe reopened in 2001 with an updated interior that looked nothing like the Double R Diner. Since then, it has been proudly serving its Snoqualmie Valley patrons while also bitterly disappointing its Twin Peaks-minded visitors, journalist and civilian alike. However, as of September 2015, the old Twede’s/Mar-T/Thompson’s Diner was back. 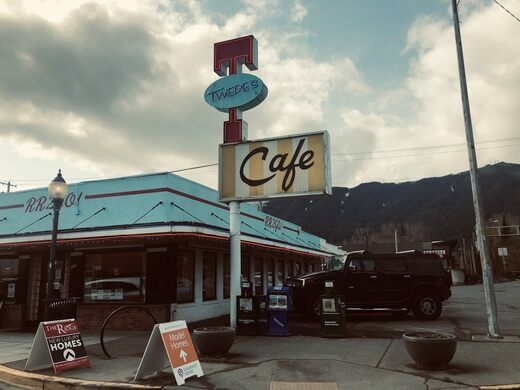 As part of the production of the revived Twin Peaks (and on the production company’s dime), the interior of Twede’s Cafe was fully restored to the moody, campy diner of our fondest Lynchian memories. The restaurant again served as the shooting location for the Double R Diner. The renovations are permanent and stayed in place after shooting ended. So call a meeting of the Bookhouse Boys, or maybe just ask your estranged wife to help you get out of prison on work release: the Double R Diner has returned. If you want to go onto further Twin Peak location adventures, they offer a Twin Peaks map. This medieval village/restaurant perpetually celebrates the year 1376.